If you want to read a quick overview of this in Spanish, check my post about GTM at DoctorMetrics. Google has just unveiled a new tool: Google Tag Manager. I have spent a few hours playing with it (both before and after official release.) And it's awesome! Or at least, it has quite a lot of awesomeness, hidden behind a seemingly simple interface. So, what's Google Tag Manager good for (exactly)? But what happens when you want to change this tracking category, or add a new tracking to another link? You have to edit all required pages in your site. If the site is well structured, this will be easy, but not all websites are well-structured. Or you are not the webmaster. This is the main point: what if you are just an external consultor? Exchanging 15 emails to get the IT staff to add this onclick can easily drive you nuts (and cost you and your employer many hours) You don't have to get nuts any more. As easy as that... But you also need to add the event tracker to that link. How? The simplest way I've come up is with some basic jQuery magic. 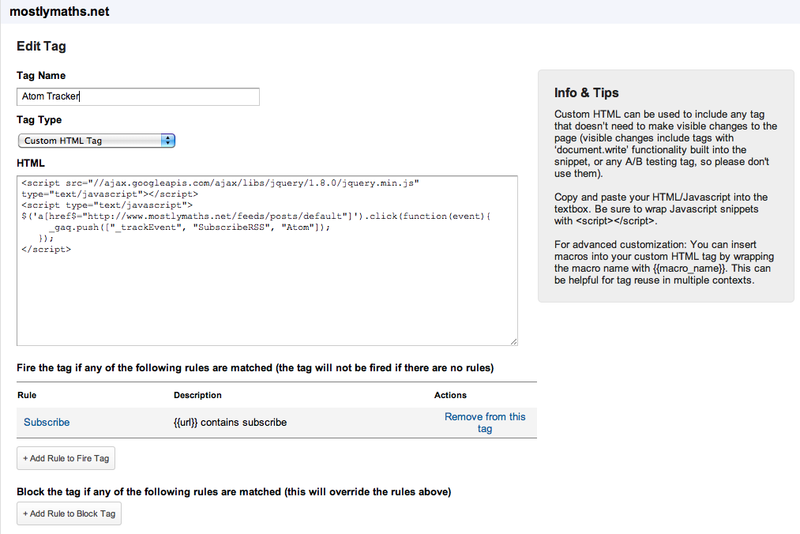 Include jQuery (which you can do for all pages, not just subscribe!) 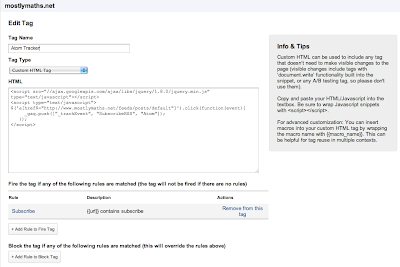 and then set the gaq push event, by selecting the correct link via the href attribute of the link. You can select based on text, or anything you fancy, of course. The options available are almost limitless: enjoy your new GTM goodness! And feel free to contact me for more implementation details or ideas.